A few days ago, I had the great joy not only of visiting the cell of Julian of Norwich in England — but also of sharing this experience with a group of old and new friends. Julian lived in Norwich, England, from 1341 to 1415. She was a mystic, an author, a healer, a spiritual guide to countless seekers. She was canonized by the Catholic Church, and is now known to many as Saint Julian. Visiting her shrine has become a pilgrimage for those who revere this humble and devout woman. But that’s not why I wanted to visit. In fact, I grew up knowing very little about Catholicism — and what I did hear never seemed particularly positive. Almost all of my friends who were raised Catholic abandoned their childhood religion — jokingly calling themselves “recovering Catholics”. That, coupled with the continual stream of news about sexual abuse, made me less than receptive to Catholicism. I have always deeply loved the art I have seen in Catholic churches. Many of my most memorable and moving art experiences have been in the presence of devotional “Catholic” art created by Caravaggio, Michelangelo, Matthias Grunewald or Martin Schongauer — to name a few. But if I’m honest, it wasn’t just the art. . . Many of my lifelong spiritual guides were, in fact, Catholic — Brother Francis and Sister Clare of Assisi, Teresa of Avila and St John of the Cross. I not only visited Assisi in Italy and Avila and Toledo in Spain twice — both times finding myself profoundly moved — but I have also turned to their writings and life histories as sources of inspiration for my own spiritual practice. But I told myself that although these four men and women are now widely revered, this was not the case when they were alive. All four of them stood up to what they felt were great hypocrisies in the existing church and sought to create new ways. These radical choices along with their mystical writings were what drew me to them. In fact, It often felt to me as though they had transcended the religion that claimed them. Then I discovered the writings of a Franciscan priest named Father Richard Rohr, whose radical but loving critique of the hypocrisies of the Catholic church has become an inspiration to people all over the world seeking a path of Love in religions that seem more intent on preaching hate. Getting Father Richard’s Daily Meditations every morning and realizing how much I loved and looked forward to them shifted something in my soul. Although my spiritual practice had been the grounding grace of my entire life, I had never found a true spiritual home. It wasn’t until I attended an interfaith/interspiritual seminary that I understood that my spiritual home was never going to look like a building or a religion. I had to find it first in my own heart — by opening that heart to whatever I have to learn from any religion or practice or person — and then risk sharing my cracked-open heart with others. Over the past few years, that’s what I have been doing. Whether I am hiking under a cathedral of aspen, worshipping with a congregation of wandering sheep, quietly meditating on a painting in a museum, stopping to smell the roses in a new neighborhood, chatting with a seatmate on an airplane, officiating a wedding, giving a talk about joy or hope or getting lost or being found or how much I loved my dad, or traveling with a group of former strangers and now dear friends — I am in my spiritual home. That’s why I wanted to make my own little pilgrimage to Julian’s cell with this group. 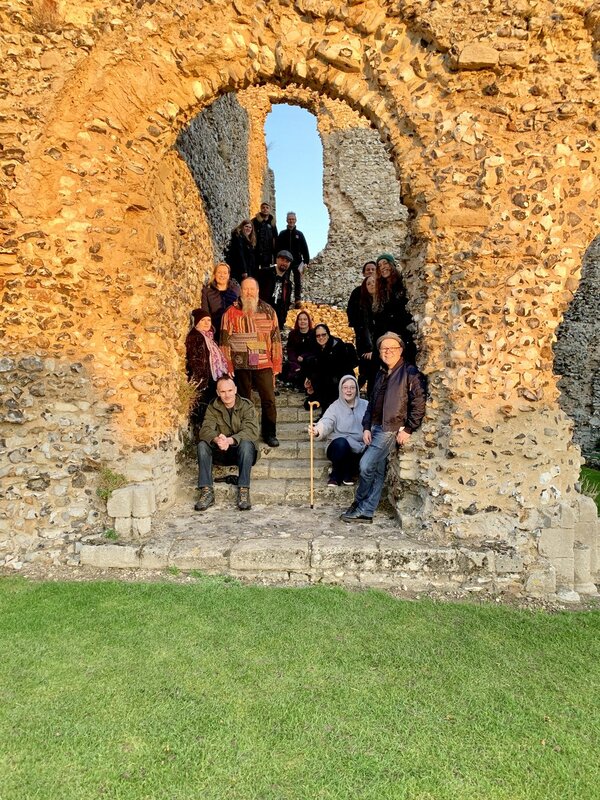 Fifteen of us gathered in the tiny cell attached to the side of a small medieval church in Norwich last Sunday morning. At first I shared what I know of Julian’s life — how she asked God to afflict her with a mortal illness so she could better understand Him/Her, how she received 16 rather gruesome “showings” which revealed to her something extraordinary — that All is Love, and how she went on not only to recover from her illness but to choose to dedicate her life to sharing this message of Love with others by living for decades in this cell (never leaving it). Then there we were. What would happen next? After all, we were fifteen people with very different backgrounds — from England, Scotland Ireland, and the United States. Fifteen people, the majority of whom would likely say that they are drawn to dark things such as horror films, visiting graveyards, stories of the supernatural, and all things spooky or scary. Well, for half an hour, we talked about faith and fear and deep disillusionment with religion and religious leaders. We talked about ritual, in particular the lighting of candles. We talked about the past — the poverty and plagues and famine and brutality of this beautiful medieval town of Norwich. And we talked about the present — the poverty and plagues and famine and brutality of our modern world. As we sat in this small cell, I think we all felt the presence of this woman who had dedicated her life to sharing a message that was greater than all the bloody brutality of the times in which she had lived — the message that we were all one in Love. She called it oneing — with Love in love. That morning — and all weekend long — I think we all felt oned in Love. . .the love of finding connection, community and collective joy. Over the past few decades, I have found more and more inspiration in the practical mysticism of Julian of Norwich, Teresa of Avila and John of the Cross, Brother Frances and Sister Clare, Meister Eckhart and Rainer Maria Rilke, Mary Oliver and Caspar David Friedrich. Each of them have experienced something seemingly inexpressible that connected them to something larger than them — something that cracked their hearts and minds open. Yet they all felt driven to share that Great Mystery with others. But I often wondered how I could possibly share what inspires and moves me with others who are inspired and moved by very different things while at the same time opening myself up to what inspires and moves them? I got a beautiful answer to that question this past weekend. The night before we visited Julian’s cell, we all went on a ghost walk through the nighttime streets of Norwich. Everyone there had been on many ghost walks. This was my first — and frankly it was the part of our two-day adventure about which I was least excited. I’m always cold, and the thought of standing outside in the dark while someone told spooky stories seemed a bit silly. Well, wouldn’t you know? I was the one with the biggest grin on my face — and it was the absolute highlight of my trip. I LOVED seeing the ancient streets by moonlight and hearing the vivid ancient tales of Norwich as told by a master storyteller who brought it all to life. At one point, we found ourselves standing next to a five-hundred-year-old timbered building sagging severely to its left surrounded by beds of lavender in the shadow of an ancient church. It was stunning. Until we realized that we were standing on top of mass graves — where people had been buried dead and alive during the Black Plague. As our guide vividly described the disease and how people came to mistakenly be buried alive, I felt a chill better than any I could experience in any horror film. The feeling carried over to the next morning. As we gathered in Julian’s cell, I realized that I understood far better what her life had been like — the backdrop of sickness and sorrow that accompanied so much medieval life. Against that backdrop, how profound her message of Love must have been! As we spent the rest of the day visiting old churches and ancient cemeteries, I found joy not only in the beauty of those places, but in connecting to lives past and lives present with my fellow travelers. Throughout the weekend, as we all shared our experiences of mystery — I felt a sense of hope that I haven’t felt in a long time. The hope that all of the divisiveness in this world may in fact be exactly what brings us all together. Over our final lunch, we were asked to share a film that still scares us to death. When Jason quipped, “The News” — we all nodded. It was true. No scary story or horror film could ever be as scary as the news we get every day. This was just as true in Julian’s day or Teresa’s or Brother Francis’s. . .the news of the world is the scariest story of them all. We have always been told how much there is to be scared of — particularly in our fellow human beings. But as I sat there with my new and old friends this weekend, I saw another way that we are oned. The search for spiritual meaning finds its inspiration from the same things as horror movies — that which scares us in real life. We are all looking for the same thing — something that connects us and brings us hope and peace. We are all longing for Love. When we come together and find the common ground that unites us in that Love — we cease to long and we feel that we belong. As we sat together in Julian’s cell, I felt so deeply and profoundly how pleased she would have been to have this sacred space used for our particular experience of one-ing in Love. All shall we well, and all manner of things shall be well.